(Nanowerk News) Australian and Italian researchers have developed a smart sensor that can detect single molecules in chemical and biological compounds – a highly valued function in medicine, security and defence (Nature Communications, "Reversible gating of smart plasmonic molecular traps using thermoresponsive polymers for single-molecule detection"). The researchers from the University of New South Wales, Swinburne University of Technology, Monash University and the University of Parma in Italy used a chemical and biochemical sensing technique called surface-enhanced Raman spectroscopy (SERS), which is used to understand more about the make-up of materials. They were able to greatly amplify the technique’s performance by taking advantage of metal nanostructures, which help generate ‘hotspots’ in close proximity to the metal surfaces. 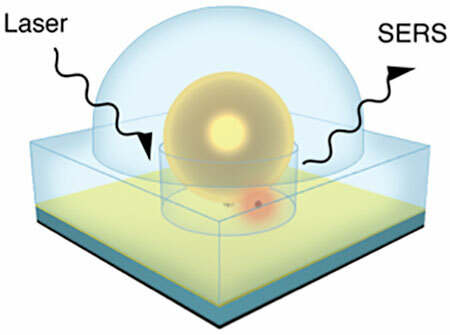 The sensor was created using gold nanoparticles which self-assemble onto a gold- and silica-coated silicon base. This approach means the nanoparticles find the perfect spacing to achieve lots of uniformly distributed hotspots on the surface. The hotspots also used a heat responsive polymer which acted as a gate to trap molecules, but importantly also allow them to be released down the track. “The sensor shows not only a good SERS reproducibility but also the ability to repetitively catch and release molecules for single-molecular sensing,” postdoctoral fellow at Swinburne's Centre for Micro-Photonics, Dr Lorenzo Rosa, said. The technique used in this work has various applications for other measurement and detection systems sensitive to humidity, pH and light.